When Navajo Tribal Police officer Bernadette Manuelito reluctantly arrives to speak at an outdoor character-building program for teens in the El Malpais badlands, she discovers that one of the young girls has gone missing and that a program counselor who set off to find her has not returned. When the girl, Annie, manages to come back on her own, she tells Bernie that while trying to find shelter she discovered a lava cave containing human bones. As Bernie’s husband, Sergeant Jim Chee, heads off to Santa Fe for a training session and to check up on Bernie’s troubled sister, Darleen, Bernie finds herself wrapped up in tribal council politics, a puzzling mystery involving human remains and ancient petroglyphs, the arrival of a new FBI agent, and a protracted search for a missing man who may have been involved in questionable accounting practices at the foundation for which he worked. 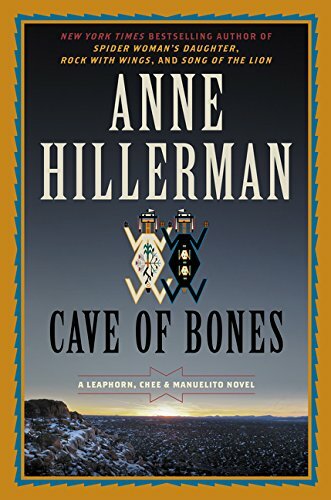 Cave of Bones is Anne Hillerman’s fourth novel in the series that extends the work of her late father, Tony Hillerman. When he passed away in 2008, Hillerman had published 18 novels in the extremely popular police procedural series featuring Navajo tribal police officers Joe Leaphorn and Jim Chee. After her father’s death, Anne Hillerman and her husband, photographer Don Strel, published a nonfiction book entitled Tony Hillerman’s Landscape (2009). While touring to promote the book, she was often asked if Tony had left any other manuscripts that would be posthumously published. He had not, and she soon realized she missed her father’s work as much as his fans did. Eventually she decided to take up the arc of the series herself and tell new stories featuring her father’s characters and the Navajo landscape they inhabit. The question each reader must therefore decide for themselves when it comes to Cave of Bones and the series as a whole is whether her work is a mere imitation of her father’s, or if it deserves to be read as the product of her own creativity, distinct from the 18-novel canon that preceded it. To begin with, Anne Hillerman has a clean, tight, and consistent writing style. A former journalist who covered the Southwest for the Santa Fe New Mexican and the Albuquerque Journal, her prose shows the same discipline and economy of description that other authors such as Michael Connelly also bring to the genre from their newspaper reporting experience. At the same time, she’s capable of very nice touches that reveal her comfort level as a writer of fiction. When she uses a rare simile, for example, it catches our eye. While talking to Bernie, the young girl Annie “rose from the bench, graceful as a fawn, and began to pace.” Only a four-word phrase in the middle of a sentence, but it pops in our mind’s eye as a vivid image of the character. Later, when Bernie gets into her freezing-cold police cruiser, she “slid across the icy seat . . . started the engine, and as soon as the temperature gauge moved a micron off the C, switched on the heater.” A small touch of humorous sarcasm that reveals Hillerman’s firm command of her narrative voice. While the primary characters come across as quite consistent with those of her father—which is fine, thank you—the manner in which she has expanded and developed Bernie Manuelito’s point of view is gratifying. Under Tony Hillerman’s pen, Bernie was a secondary character who might not have received quite as much attention as she deserved, but in moving her front and center into the spotlight, Anne Hillerman does the character full justice and brings a fresh take on her father’s fictional universe. The only false note is the new FBI character Agent Sage Johnson, who comes across as an annoying caricature right out of the gate. That Johnson asks Bernie for a mulligan at the end of the novel in the hopes of improving their working relationship going forward, however, is a small conciliatory gesture on Hillerman’s part that this character might be a little easier to take next time around. In sum, Cave of Bones is a success. It’s an enjoyable and entertaining novel that takes us once again into a landscape and a culture we’ve learned to appreciate on many levels. It’s easy to read, it pleases the sensibilities, and it answers our earlier question nicely—this fictional universe now belongs firmly in the hands of Anne Hillerman.